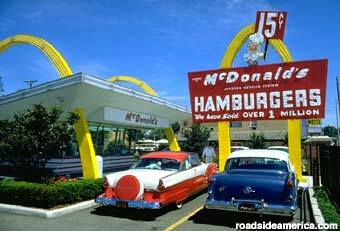 McDonald’s signs used to boast how many hamburgers it sold. In 1955, the dynamic tagline also communicated the growing public’s confidence in their product. The millions soon became billions and when it hit 99 the sign changed to read billions and billions served. Today, the message isn’t even worth posting. Once upon a time, the growth rate of a company mattered. Simply stating the number of hamburgers sold mutually assured the McDonald’s franchisee and its customer as well as inspiring confidence in their investors. Results to date are no longer proving inspiring, especially when it comes to the investment market. This is not the simple adage by brokers and advisors warning shareholders that past performance is no guarantee of future returns. Today’s Wall Street Journal reports that advisors, no longer satisfied when a company meets its growth and profit targets, are looking further down the supply chain. Threat Builds on the Margins, read this morning’s headline. 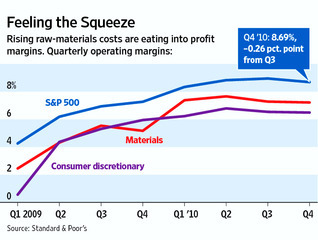 It seems that rising commodity prices put pressure on companies’ profitability. This message echoed the email alert that arrived last week about CISCO, when its stock price took a dive in spite of the company posting increased earnings that were on target. Management by definition is a process of staying on track. Today many business analytic and business intelligence indicators exist which implies that smart companies notice the underlying rise in commodity prices and naturally take necessary steps to insure their business and growth trajectory continues. News of an increase in commodity prices is good if your business is selling commodities. Higher prices lead to higher profits, right? Remember two summers ago? The rapid ascent of both oil and energy prices did not result from higher production costs, increased scarcity or mirror seasonal changes in demand. Commodity prices are not easy to forecast and they anything but stable. The spike then as today could be the result of political tumult in the gulf region. In part, rising agriculture prices follow rising energy costs…more corn into bio fuels, or higher costs to driving the tractor or transporting the product to market. Extrapolating that higher commodity prices will however diminish a company’s ability to deliver on its growth or profit targets minimizes the impact of management to stay the course when the water gets choppy. Furthermore, this information or analysis won’t help a company like CISCO, where the pressures on their margin are a little different. In many ways, routers and internet connections have become a commodity based business, the result of increased competition from capable suppliers such as HP and Juniper flooding this market. For every market that CISCO has grown or opens, the competitors are quick to follow. Margin pressures are a fact of life and how leadership responds, or reads and acts on the warning signs first visible to the commodity producers, has repercussions up the supply chain. Innovation is a vital strategy for large companies like CISCO, GE and P&G who can capitalize on their strengths and agility to adapt, add new products, enter new markets. Innovation allows them to jump the track and avoid barreling ahead into the inevitable abyss of a shrinking margin and/or market. The process or approach they use does not disrupt the entire organization, not everything changes at once. This strategy dedicates proportionate resources and priorities to ongoing development or M&A , with standards and expectations that differ from those applied in the ongoing business units. In time, the innovation once proven sufficiently robust for the larger corporate goals, receives more resources. Innovation, yes, it is a good solution; but no matter what approach or model that follows, tension remains within the existing organization forecast and resource planning function. It appears that even with a track record like CISCO, the market has enough uncertainty to short the stock. Alternatively, consider addressing the shrinking margin problem by justifying your process, price and product value not in business or economic terms as the analysts do, but in customer terms. Extending this idea is the Shared Value construct that Michael Porter and Ed Kramer recently wrote up in Harvard Business Review, and similarly aligns with Peter Senge‘s whole systems approach around sustainability. Both literally upend the traditional business economic model. Shared Value revolves around the point of decision where a firm’s values intersects the values of its customers. where both choose to act out of respect for the bigger picture, the full operating environment and its constraints. Once again, it’s McDonald’s that exemplifies this approach. It began with the war against Trans-fat that forced fundamental changes. Today, McDonald’s offers fancy coffee and sells oatmeal, the hallmark of good nutrition that led to a 3.1% growth in same store sales in January. Both CISCO and GE incorporate this approach into their strategic plan and, in addition to Innovation, Shared Values helps them endure. The value/returns are not easily measured but maybe it’s because shared values are not so easy to assign. McDonald’s may no longer have to tell its customers and shareholders how many billions of hamburgers they sell, but the more holistic an approach they take to delivering value and align it with price, they continue to avert disaster.